Adaptogens played a big role in my life and wellness routine last year. After taking an adaptogens workshop at Spiritweavers Gathering, I felt inspired to find ways to regularly add them into my smoothies. If you’ve never heard of them before, adaptogens are botanical medicine that aid in our body’s ability to adapt to stress and our environments. They promote increased physical endurance and mental focus, a strong immune system, a balanced mood and so much more. This Adaptogenic Golden Mylk Smoothie combines one of my favorite flavor profiles with astragalus and chaga. Don’t feel limited to using (just) those two. There are so many powerful adaptogens out there, and I always encourage people to explore and discover the ones that resonate most with them. 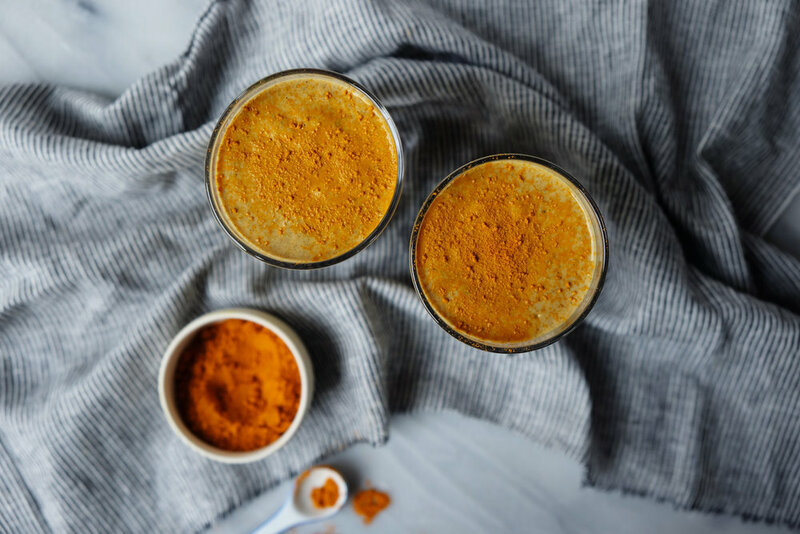 This smoothie is great for the winter months with warming ginger and turmeric. If you prefer a lighter version, try making this Cashew Golden Mylk and adding the adaptogens. Some of my other favorites adaptogens are maca, rhodiola, moringa, reishi and matcha. What are your favorites? 1.) In a high-speed blender, blend all ingredients on medium until smooth. 2.) Serve sprinkled with ground turmeric and/or bee pollen. Enjoy! Turmeric has been such a blessing. I’ve recently been diagnosed with fibromyalgia. I read that it’s important to cook the turneric for about 8-10 minutes with water til it forms a paste. This is supposed to make the properties in turmeric available to the body. Also use an oil and and a sprinkle of pepper and as you did, the ginger because these function to make turmeric a properties more available.